First of all, thanks so much for asking me to tell you about something this week. This blog has filled my life with so much warmth and information, and your efforts to shine an edifying light on the underdeveloped corners of my pop culture soul continue to make me a better human being. I know you’re having a busy week, so the least I can do is pick up the baton for once and tell you about a Miyazaki movie. Liz, like many of us who spent our childhoods in the 1980s, I experienced a deep, early love of cartoons. It started with the animated shorts on Sesame Street and reached its zenith with the arrival of The Muppet Babies, whose imaginative flights of fancy and media mash-ups were the highlight of my Saturday mornings. But like many of us, I gradually realized that most of the other cartoons I was devouring were totally terrible: derivative, violent toy commercials of the crudest hand-drawn sort. (For me, the breaking point was probably the day I recognized the imperialist undertones of The InHumanoids.) In many ways, the 1980s were the nadir of American animation. Meanwhile in Japan, the 1980s were an animation renaissance, spearheaded by the formation of Studio Ghibli, the company formed by animator-auteurs Hayao Miyazaki and Isao Takahata. 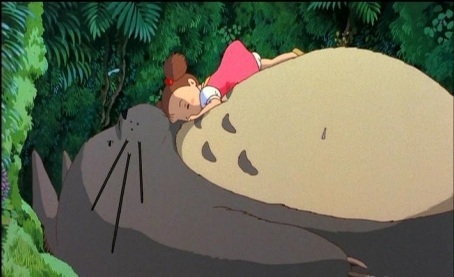 I’ve seen a number of Miyazaki movies, but I’ve actually never seen My Neighbor Totoro, so I’m very pleased that we’re sharing it for the first time together. 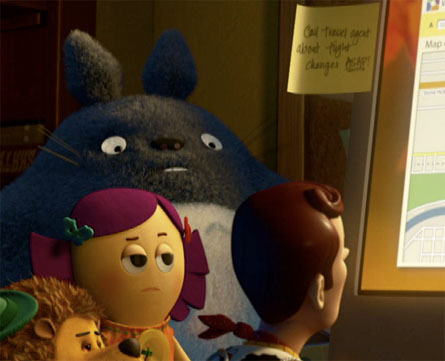 For the record, I’m watching the 2005 Walt Disney Pictures release of Totoro (though, as evidenced by the Toy Story 3 trailer at the beginning, it’s actually the 2010 reissue of that release). The Disney dub features Dakota and Elle Fanning, Tim Daly, Pat “I Was Ursula the Sea-Witch” Carroll, and Frank Welker, but I’m watching with the original Japanese language track and subtitles (even though, as you know, I’m a great admirer of the work of the Sisters Fanning). The movie opens with a charming, deliberately flat and doodly-looking credit sequence in which a large monster walks across the screen and poops out a series of pellets that grow into more happy, wide-mouthed creatures that spell out the title and bounce along to the jaunty opening theme. Then a little girl marches determinedly across the frame with a bunch of bugs. I should note that one of the most charming and astounding things about Miyazaki as an animator is the way he’s able to combine a freewheeling cartoon surrealism (the kind you’d expect to find in the margins of a great cartoonist’s notebook) with extremely realistic depictions of the contemporary world. This juxtaposition is at play as soon as the credits end and the first shot opens with a three-wheel truck, packed tight with a family’s furniture, driving through the meticulously realized Japanese countryside. Here’s where we meet our two heroines, crouched in the back under a desk, sharing candy and shouting to their dad in the cab up front. Their names are Satsuki and Mei, but I’m going to call the ten-year-old “Jo” (after Alcott) because she is spirited and bossy (and has a sassy Winona Ryderesque haircut) and the four-year-old “Ramona” (after Cleary) because she is rambunctious and imaginative. They hide when they think they see a policeman on a bicycle, because even in Japan in the late fifties kids aren’t supposed to ride under furniture in the flatbed of a truck, but then they wave and shout excitedly when he turns out to be a civilian. All the best kids’ movies are wholesome and subversive at the same time. The girls go to unlock the old kitchen at the back of the house, and when they do IT IS FULL OF A HUNDRED LIVING BALLS OF SOOT that scatter immediately into the darkness. If you’ve seen Spirited Away (which I don’t think you have — follow-up post?) you’ll recognize these animate soot balls. 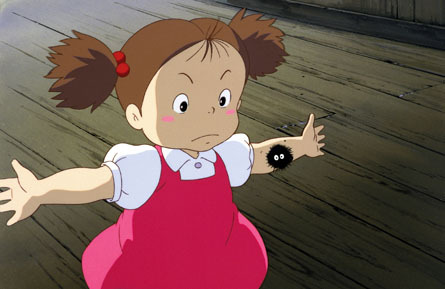 (Spoiler alert: Spirited Away has animate soot balls.) The girls freeze for almost a minute, then shout as loudly as they can after the soot balls. It’s not a scared yell. It’s like a battle cry. Then Jo announced resolutely, “Let’s go,” and they march into the kitchen. Liz, these girls are charming. Ramona has plans for this soot ball. Their dad calmly explains that the creatures were probably “soot gremlins,” then assigns them the quest challenge of finding the stairs to the attic. They do, and then Jo spazzes off somewhere, but Ramona stays, and we can tell from her face that she’s all, “I’m gonna catch a soot gremlin, dammit!” She reaches into a crack between old wall boards, a dozen soot balls scatter out, and she slaps her hands around the last one. She runs to show Jo and Dad, but when she opens her hands, they’re just covered with soot. So she’s a murderer. Fortunately, an elderly neighborwoman, Ursula, has arrived. She demands to be called “Granny,” even though she is a total stranger. She knows all about the “soot sprites” and explains their deal. They’re spirits who live in old houses, and if you’re nice, “they won’t harm you.” (And I guess, if they don’t like you … Hausu?) Jo is annoyed that Ramona is not afraid of the soot sprites, so she tells her that tonight she has to walk to the bathroom by herself and that probably a giant soot sprite will eat her. Again, totally authentic sibling depiction. Jo meets her pint-sized love interest, Henry Huggins, who is terrified of both girls and ghosts. (According to Lauren, in the original dub, he shouts upon leaving, “Hey! You’re living in a haunted house!” He’s sort of the Scatman Crothers of this narrative.) That night, during a collective hot bath, the family hears a frightening wind storm, and Dad instructs the girls to laugh maniacally until they’re not scared anymore. This works really well, because in the attic all the soot sprites fly away. It turns out the family has moved to the country to be close to their mom, who is convalescing in the hospital due to an unnamed illness, probably tuberculosis. (Because again, reality.) In this Disney version, their mom is Lea Salonga from the Broadway helicoptersploitation classic, Miss Saigon. Also, Liz, the Fanning sisters are excellent in this vocal dub. There’s nothing they can’t do. Those acorns don't belong to you! Also, the girls live next to a magical forest. One day while Jo is at school, Ramona spots some bunnyish ghosts stealing acorns from their yard, so she follows them into the woods, where she finds a giant version of the creatures snoring inside an enormous tree. He’s kind of a cross between a beaver, a rabbit, a koala, and a panda, but it’s really just better for you to see him. The creature is really sleeping one off, but Ramona climbs up on his belly and bugs him until he wakes up. She asks his name, and he kind of growl-roars some syllables that she interprets as “Totoro.” She is immediately totally in love with him. 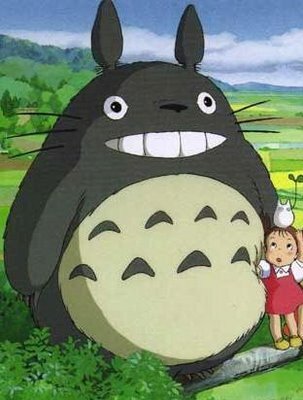 Oh, I’m just going to call Totoro “Totoro,” since he is as famous as Mickey and Pooh and Batman. Liz, this guy’s a star. He’s got it. When Jo gets home, she asks where Ramona is, and Dad admits that he hasn’t seen her for hours. He’s been busy working at his desk. (I can’t tell what his job is, but it involves filling in hundreds of boxes on large sheets of paper.) Also, he’s kind of a space cadet. Jo finds Ramona asleep in the bushes at the edge of the woods. Ramona tells Jo and Dad all about Totoro, and tries to lead them back under the bushes along the path into the heart of the woods, but now the path just horseshoes back around into their own yard. (WHAT? Magic.) Ramona gets mad because they don’t seem to believe her story, but then Dad explains that she probably met an enchanted wood spirit and this is all a normal part of the foresty supernatural events. Jo and Ramona’s dad, while negligent, is also a hilariously open-minded positivist. I'm just waiting for the Number Cat-Bus. If there’s one character that somebody’s described to you from this movie. It’s probably Cat-Bus. He is very surreal. (Lauren: “He’s weird but not so weird that it’s off-putting. It’s barely recognizable that a human made this. But it’s still relatable.”) His eyes are headlights and there are glowing mice on his bottom for taillights and he is a cat and you ride inside him. Totoro gives the girls some acorns and they plant them to see if they’ll grow. 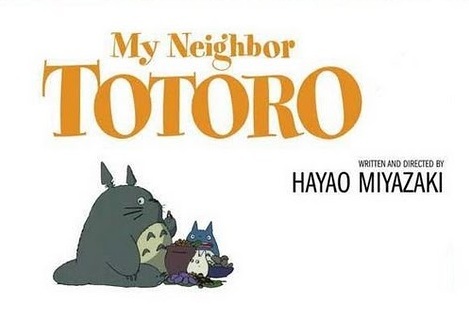 (If you haven’t yet noticed, My Neighbor Totoro is not what you’d call a plot-heavy film.) A few nights later, Totoro and his little wood spirit friends show up in the yard. They do some sun salutations with the girls. 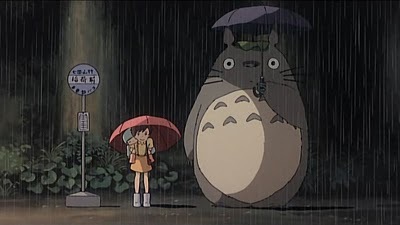 (You’ll be pleased to see that Totoro is now incorporating the umbrella into his work.) Then the acorns grow into a hundred-foot tree. To celebrate, they all fly over the fields for a while on Totoro’s magic dreidel, and then Totoro plays them a song on his ocarina. The next morning, the giant tree is gone, but the acorns have sprouted. “We did it!” shout Jo and Ramona. 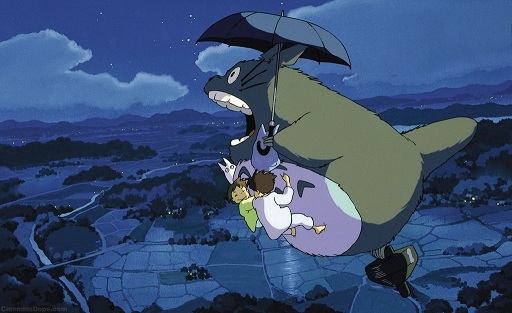 Also the movie explains that invisible flying Totoros are where wind comes from. Lauren has had to go up to the office at this point, so I’ve switched back to the Japanese language track. I really want you to have all the angles here, Liz. You know, I’ve had friends say from time to time that they prefer the dubbed versions of particular things to the original language versions, and I always internally roll my eyes. I will admit, though, switching back like this, it’s noticeable that the actors playing Jo and Ramona in the Japanese version are adults pretending to be children. (Looking up their résumés online, I see that they were both in their late twenties when they recorded the dialogue.) Both the adult actors in the Japanese version are great, don’t get me wrong. But honestly, I kind of prefer the authenticity of the child actors in the English version on this one. Certainly the comparison is helped by the fact that the Fannings are preternatural actor geniuses. I heard you guys were making an animated film about mortality...? When Jo realizes that Ramona is alive, but still lost, she finally decides it’s time to call upon that giant magical monster that she knows. She goes to find Totoro, and Totoro calls up CAT-BUS. Jo climbs inside Cat-Bus (whose interior is furry and plush), and Cat-Bus’s destination placard flips to “RAMONA,” and off they go flying through the air. The sisters are reunited. Cat-Bus takes them to the hospital, they see (through a window) that their mom is okay, and they leave the ear of corn on her windowsill. Mom says she thinks she sees the girls in a nearby tree with a twelve-armed cat beast. Dad is unfazed. Totoro plays the ocarina. The End. Liz, this movie is a masterpiece. You should watch it immediately. 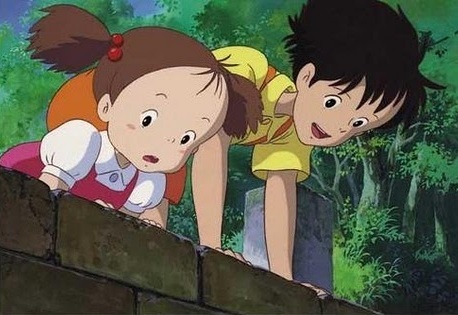 The vanishing of the green pastures and unspoiled forests that they tromped through in their youths is a connecting thread in the creative work of Miyazaki’s Japanese contemporaries. (You can even feel it in The Legend of Zelda.) Anyway, that very quiet sense of loss kept picking at me in the movie’s quiet moments, especially after this week where we saw the Japanese landscape once again suffer so much devastation. 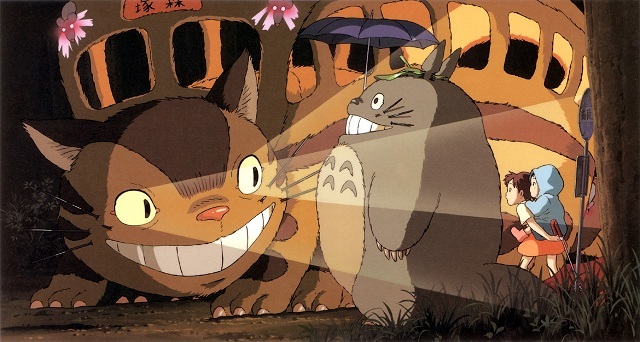 My Neighbor Totoro eventually grossed zillions of dollars on video and in merchandising, but it was actually not a hit in its original theatrical release. The reason: Totoro was released as a double feature with 1988’s other Studio Ghibli production, Isao Takahata’s Grave of the Fireflies, an animated drama about two orphans wandering through firebombed Kobe during the Second World War that’s almost universally regarded as excellent and which our friend Jeff described as “one of the most depressing movies I’ve ever seen.” So apparently a lot of parents didn’t want to take their giant-wood-spirit-loving kids to it. On a happier note, you can go visit a life-sized recreation of Satsuki and Mei’s house outside the city of Nagoya! Also, if you go to the Ghibli Museum in Tokyo, you can watch a short subject Totoro sequel called “Mei and the Kittenbus.” KITTENBUS!! Posted on March 15, 2011, in All the Spoilers, Movies, Other People Telling Liz Stuff and tagged frank tells liz, mass transit felines, miyazaki. Bookmark the permalink. 10 Comments. Apparently there was also a huge mock-up of CATBUS at Pixar’s headquarters. Miyazaki delivered it to Lasseter himself during a visit. From what I understand, it sprang creepily-cheerfully through one wall. Loved the review. 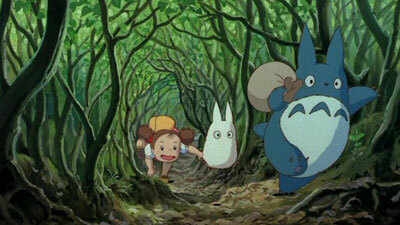 Totoro (and Miyazaki in general) are huge favorites of mine. If Liz hasn’t seen “Spirited Away”, that must be addressed. In conclusion, CATBUS. (Also, the MN Children’s Museum had an exhibition a few years ago that had the Catbus in it. My godchild remains enthralled, and has a three foot Totoro from it as well). I would think Liz remembers this since we own a copy of the original undubbed Totoro on VHS and I’m sure she and Eric saw it a couple of times. We even have a little blue Totoro somewhere in the house. Loved your review of it Frank!